A round up of Easter commemorative events by republican organisations this year. Please check locally for more information. Derry 1916 Societies is organising an independent commemoration of the 99th anniversary of the Easter Rising. It will take place at the Republican Plot in Derry City Cemetery and those attending are asked to assemble at 2.30pm on Saturday, April 4th, at the gates of the Cemetery. Invitation is open to the public. 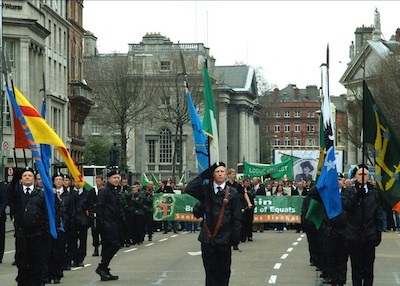 The 1916 Societies in Dublin are holding a commemorative rally on Saturday, April 4th. The march will assemble and set off from the GPO at 1pm and will go along the Quays of the River Liffey to Arbour Hill. Republican Network for Unity’s annual national commemoration will take place at its traditional focus point of Dundalk, County Louth on Sunday 5th April 2015, assembling at Market Square @11.45am, proceeding to the Republican plot in St. Patrick’s cemetery. The IRSM Easter Commemoration departs from Dunville Park, Falls Road, Belfast, at 11am on Sunday, to the Irish Republican Socialist plot at Milltown Cemetery. Members, bands, and those carrying wreaths are asked to attend at Dunville Park by 10.45am. Dominic & Mary McGlinchey Commemoration: Assemble Deerpark Road, Bellaghy at 4pm on Easter Saturday, 4th April. Duleek Independent Easter Commemoration, Friday 3rd April at 6pm Assemble at the Hunger-Strike monument, Station Road, Duleek, County Meath. Organised by the Duleek 1916-1981 monument committee. All welcome. Arbour Hill, Good Friday - 1.00pm Followed by Poc Fada competition in the Phoenix Park. Markievicz Park, Ballyfermot - 11am Elizabeth O’Farrell Park, City Quay - 12.30 Crumlin Cross 2pm march to Willie Pease Park and Eamonn Ceannt Park. Cabra, Matt Whelan Bridge - 1916 Plaque - Wreath Laying 4pm. St Paul’s, Glasnevin Cemetery, 1916 Plot - 11am, Car park entrances. Main Dublin 1916 Parade assemble Garden of Remembrance, Parnell Square, 2.30pm Feeder Marches from 1916 Garrison sites all assembling at 1.15pm Liberty Hall - City Hall- Fr Mathews Hall Church Street, Cabra Bridge - Annesley Bridge. Clondalkin, Civic Offices, Clondalkin village, Assemble 12 noon. Dun Laoghaire, assemble 2.30pm Casement Villas opposite Bakers corner for 3pm commemoration. Sinn Fein Belfast’s Easter Commemoration takes place on Sunday 5th April. Assemble Beechmount Avenue at 1pm, parade leaves 1.30pm sharp. Speaker: Gerry Kelly MLA. ARMAGH Holy Saturday, Lurgan, commemoration, assemble bottom of new section, St Colman’s Cemetery, 1pm for march to the Republican Plot, . Holy Saturday, Armagh city, Assemble Republican Plot, Sandyhill Cemetery, 3pm, for wreath-laying ceremony. Wreath-laying ceremonies will be held over the Easter weekend at Republican monuments throughout South Armagh. CARLOW Holy Saturday, wreath-laying ceremony, Republican Plot, Carlow town, 1pm. CAVAN Easter Sunday, wreath-laying ceremonies at at the grave of Vol Patrick McManus, Killaduff Cemetery, 1pm and later at the grave of Vol James Crossan in Kilnavart Cemetery, Co Cavan. CLARE Easter Sunday, wreath-laying ceremonies at Kilmurry McMahon and Doonbeg. CORK Easter Monday, wreath-laying ceremony, Republican Plot, St Finbarr’s Cemetery, Cork. DERRY Cuchulainn Memorial, City Cemetery, Derry City, Easter Sunday, assemble at 12 noon. Wreath-laying ceremonies at the following on Easter Sunday morning: The Loup Cemetery, 9am, at the grave of Brigadier Sean Larkin; and the grave of Tommy Toner in Dungiven, 10.15am at the graves of Vols Kealy, O’Carolan and Kilmartin and hunger striker Kevin Lynch. DONEGAL Wreath-laying ceremonies at Doneyloup, Castlefin, Clady Bridge will take place over the Easter weekend. Drumboe, Easter Sunday, assemble Johnson’s Corner for march to the Drumboe Martyrs Memorial, Stranorlar. DOWN Easter Sunday, Newry, wreath-laying ceremony, St Mary’s Cemetery, 10am. DUBLIN Easter Sunday, commemoration at Deansgrange Cemetery, 1pm. Easter Monday, the Sean Healy Sluagh in Dublin will commemorate Fian Sean Healy at the location where he was executed in Phibsborough during the 1916 Rising. Following this they will march in the main Commemoration. Assemble Garden of Remembrance, 1.45pm. FERMANAGH Easter Sunday, Arney, at the grave of Philip Cassidy, assemble Cemetery, 2.30pm. GALWAY Good Friday, wreath-laying ceremony at the Workhouse, Tuam, 5pm. Holy Saturday, wreath-laying ceremony, Kilcummin Cemetery, Oughterard, 7pm. Assemble at Cathedral for parade to Liam Mellows Memorial, Eyre Square, Galway city, Easter Sunday, 11am. Republican Plot, Donaghpatrick, Headford, Easter Sunday, assemble Queally’s Cross, Cahirlistrane, 3pm. GLASGOW Easter Sunday commemoration and function. Details from SAOIRSE sellers. KERRY Holy Saturday, wreath-laying ceremony, Republican Plot, Castleisland Cemetery, 2pm. Easter Sunday, Cahersiveen, assemble 2.30pm at the Monument, The Square. Tralee, Easter Sunday, assemble at Denny Street at 2pm for parade to Republican Plot, Rath Cemetery. Easter Sunday, Killarney, wreath-laying ceremony at Republican Monument. Easter Monday, Republican Plot, Listowel, wreath-laying ceremony, assemble at graveyard gates, 12 noon. KILDARE/West Wicklow Holy Saturday, commemoration at the grave of Paul Stanley, Straffan Cemetery, 3.30pm Easter Monday, wreaths will be laid throughout the county. KILKENNY Holy Saturday, Wreath-laying ceremony, Rathciaran, Mooncoin, 12.15pm. LAOIS Wreaths will be laid on the graves of William O’Connor and James Lacey, Barrowhouse Cemetery; grave of Denis O’Dwyer, Wolfhill cemetery and the Republican Plot, Portlaoise. LEITRIM Holy Saturday, Bornacoola Cemetery at the grave of John Joe Reynolds, 2pm. LIMERICK Good Friday, Republican Plot, Mount St Lawrence Cemetery, wreath-laying ceremony. LONDON Easter Monday, See SAOIRSE sellers for details or phone 0044-7926357676. LONGFORD Easter Sunday, Ballintubber Cemetgery, 3pm, grave of General William Blake, commander-in-Chief of the Irish Fporces at the Battle of Ballinamuck, 1798. LOUTH Dundalk, Easter Sunday, wreath-laying ceremony at the Republican Plot, St Patrick’s Cemetery, 2.30pm. MAYO Kilkelly, Easter Monday, 12 noon, assemble at Church gate and parade to East Mayo Brigade Memorial on main Sligo-Galway Road. MEATH Easter Sunday. wreath-laying ceremony at grave of Vol George McDermott, Ardbracken, 1pm. MONAGHAN Easter Sunday, Commemoration, Urbleshanny Cemetery, Scotstown, at grave of Vol Seamus McElwaine, 2pm. NEW YORK Easter Sunday, April 5, at the graveside of Joe Stynes, veteran of the Irish War of Independence and co-founder of CnSN at Woodlawn Cemetery, East 233 St., Bronx, NY. Following this commemoration, a ceremony will be held at the nearby grave of Fenian Leader Col Thomas J Kelly, born in Co na Gaillimhe (Galway), who with many other Fenians and Clan Na nGael activists set the path that helped bring to fruition the historic Easter Rising of 1916. After the graveside ceremony breakfast will be served at The Heritage located at 960 McLean Ave. in Yonkers at 10.30am. For more information email nymayo@earthlink.net; enrightynyc@gmail.com or call 732 441 9923 or visit www.irishfreedom.net. OFFALY Easter Sunday, wreath-laying ceremonies throughout the county. ROSCOMMON Ballinlough, Easter Sunday, 12 noon, parade to IRA Memorial. Elphin, parade to County Roscommon Memorial after 11.30 Mass. Easter Sunday, county commemoration at the grave of Vol Hugh Tully in Kilcooley Cemetery, Tulsk, 3.30pm. SLIGO Sligo Town, Easter Sunday, wreath-laying ceremony, Republican Plot, Sligo Cemetery. TIPPERARY Easter Sunday, Commemoration, Hunger Strike Memorial, Banba Square, Nenagh, 10am. Easter Sunday, wreath-laying ceremonies at the graves of Joe Mangan and on the Old Barrack wall to four Republicans who were shot in front of a Free State firing squad on the January 15, 1923, Frederick Burke, Ileigh, Martin O’Shea, Borrisoleigh, Pat Russell, Thurles, and Patrick McNamara, Ballina. TYRONE Holy Saturday, 5pm, wreath-laying ceremony, Carrickmore..
WATERFORD Holy Saturday, wreath-laying ceremony at Statue on Quay, Waterford city, 1.15pm. WESTMEATH Details from: 086 608 2063. Wreath-laying ceremonies will take place throughout the county at Republican Graves and Monuments over the Easter period. WEXFORD Republican Plot, St Ibar’s Cemetery, Crosstown, Easter Sunday, assemble at old Dunne’s car-park, Crescent Quay, Wexford at 3pm. Mass for all who died for Ireland, Church of the Immaculate Conception, Rowe Street, 11am. WICKLOW Holy Saturday, wreath-laying ceremony at 1798 Monument between Tinehealy and Shilleagh at 2pm. Wreath-laying ceremony at the Billy Byrne Monument in Wicklow town, 4pm. Easter Monday, 6th April. Assemble Bottom of Whiterock Rd at Junction with Falls Road at 1.00PM. Leaves 1.30PM SHARP for march to Milltown Cemetery.